4 February 2004 -- San Diego, California. General Atomics Aeronautical Systems, Inc. (GA-ASI), a leading manufacturer of unmanned aircraft surveillance systems, announced the award of a contract with the Canadian Forces to deploy the company’s ALTAIR unmanned aircraft, a variant of the proven Predator B, in support of the Atlantic Littoral Intelligence, Surveillance, Reconnaissance Experiment (ALIX). ALTAIR will be integrated with a multi-mode maritime radar as well as an electro-optical, infrared camera for littoral and maritime surveillance off the east coast of Canada. The deployment will commence in August, 2004 and involve beyond line-of-sight (BLOS) operation of the aircraft and distribution of radar and video imagery to various end users throughout the Canadian land, air and maritime forces. Launched from a main operating base at Goose Bay, Newfoundland and flown on an instrument flight plan, control of the aircraft and payload will be passed to an Ottawa-based remote operations center for BLOS satellite communication operations. The surface search radar and camera video imagery will be passed to two separately-located remote video terminals (RVT). Acquisition and exploitation of payload data by existing maritime, air and ground forces will elevate situational awareness throughout the Canadian Forces. The deployment will conclude in September. This is the first time ALTAIR has been deployed to Canada but it is not the only time the company has provided its systems to the Canadian Forces. During a G-8 Meeting of all Heads of State held in Kananaskis, Alberta in 2002, GA-ASI provided surveillance using its IGNAT aircraft. Configured with a synthetic aperture radar and optical sensors, IGNAT provided real-time intelligence information in support of the Canadian security efforts. The Canadian Army also integrated the IGNAT unmanned aircraft into a field training exercise called Robust Ram which was held in Suffield, Alberta. IGNAT acquired and transmitted intelligence, surveillance, targeting acquisition and reconnaissance information into brigade headquarters where it was combined with other intelligence products. For over ten years, General Atomics Aeronautical Systems, Inc. has been delivering proven and reliable systems to customers throughout the world. In 1995, the U.S. Air Force began operating Predator in combat areas over Afghanistan, Iraq and the Balkans. Predator acquires surveillance and targeting information and immediately transmits it via satellite to various end users including command centers in-theater, RVTs in the field, receive-only terminals in the Pentagon and other locations throughout the world. With this type of data collection and dissemination, a reliable and immediate picture of the battlefield can be evaluated by officials for quick decision-making. The U.S. Navy has recently completed a Predator deployment to Alaska in which the aircraft was operated in severe weather conditions. The deployment was in support of U.S. Coast Guard operations. Real-time video provided by U.S. Navy Predators was relayed to Coast Guard headquarters in Washington, DC where senior officials were able to observe cutter operations. Additional deployments are planned which include Predator B integrated with a surface search radar. This deployment will be conducted in June 2004 in Alaska. The U.S. government has also used the IGNAT, Predator and Predator B aircraft systems for patrol of the U.S.-Mexico border. 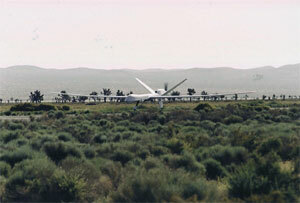 Founded in 1993, General Atomics Aeronautical Systems, Inc. has spearheaded acceptance and set industry reliability standards for unmanned aircraft systems for military and commercial customers such as the U.S. Air Force, U.S. Navy, NASA, Department of Energy and several overseas governments. Leading the industry to new levels of performance and interoperability for network centric operations, General Atomics Aeronautical Systems, Inc. uses proven design philosophies and the experience gained by the combat-proven Predator to develop aircraft systems which meet the performance requirements of customers worldwide. Mr. Thomas J. Cassidy, Jr. is President and Chief Executive Officer.